The name Accrington appears to be Anglo-Saxon in origin. In the records it variously appears as Akarinton in 1194; Akerunton, Akerinton and Akerynton in 1258; Acrinton in 1292; Ackryngton in 1311 and Acryngton in 1324. The name may mean acorn farmstead from Anglo-Saxon æcern meaning acorn and tun meaning farmstead or village. The southern part of Accrington, the township of New Accrington, was formerly in the Forest of Blackburnshire and the presence of oak trees may be inferred from local place names like Broad Oak and Oak Hill. The products of oak trees were once an important food for swine and a farmstead may have been named for such produce. Anglo-Saxon ᴁcerntun might become Middle English Akerenton, Akerinton and the like. Also worth considering is that in the Lancashire dialect acorn was akran. There is no known Old English personal name from which the first element can be derived. But if the Frisian names Akkrum, Akkeringa and Dutch name Akkerghem, are derived from the personal name Akker there may be a corresponding Old English name from which Accrington may be derived. Accrington covers two townships which were established in 1507 following disafforestation; those of Old Accrington and New Accrington which were merged in 1878 with the incorporation of the borough council. There have been settlements there since the medieval period, likely in the Grange Lane and Black Abbey area, and the King's Highway which passes above the town was at one time used by the kings and queens of England when they used the area for hunting when the Forest of Accrington was one of the four forests of the hundred of Blackburnshire. Robert de Lacy gave the manor of Accrington to the monks of Kirkstall in the 12th century. The monks built a grange there; removing the inhabitants to make room for it. The locals got their revenge by setting fire to the new building, destroying its contents and in the process killing the three lay brothers who occupied it. An area of the town is named 'Black Abbey', a possible reference to the murders. Regardless of whatever happened, Accrington did not remain under monastic control for long before reverting to the de Lacys. It is thought the monks of Kirkstall may have built a small chapel there during their tenure for the convenience of those in charge residing there and their tenants, but the records are uncertain. What is known is that there was a chapel in Accrington prior to 1553 where the vicar of Whalley was responsible for the maintenance of divine worship. However it did not have its own minister and it was served, when at all, by the curate of one of the adjacent chapels. In 1717 Accrington was served by the curate of Church, who preached there only once a month. St. James's Church was built in 1763, replacing the old chapel however it did not achieve parochial status until as late as 1870. Until around 1830 visitors considered Accrington to be just a "considerable village". The Industrial Revolution, however, resulted in large changes and Accrington's location on the confluence of a number of streams made it attractive to industry and a number of mills were built in the town in the mid-eighteenth century. Further industrialisation then followed in the late eighteenth century and local landowners began building mansions in the area on the outskirts of the settlement where their mills were located while their employees lived in overcrowded unsanitary conditions in the centre. Industrialisation resulted in rapid population growth during the nineteenth century, as people moved from over north-west England to Accrington, with the population increasing from 3,266 in 1811 to 10,376 in 1851 to 43,211 in 1901 to its peak in 1911 at 45,029. This fast population growth and slow response from the established church allowed non-conformism to flourish in the town. By the mid-nineteenth century there were Wesleyan, Primitive Methodist, United Free Methodist, Congregationalist, Baptist, Swedenborgian, Unitarian, Roman Catholic and Catholic Apostolic churches in the town. The Swedenborgian church was so grand that it was considered to be the ‘Cathedral' of that denomination. For many decades the textiles industry, the engineering industry and coal mining were the central activities of the town. Cotton mills and dye works provided work for the inhabitants, but often in very difficult conditions. There was regular conflict with employers over wages and working conditions. On 24 April 1826 over 1,000 men and women, many armed, gathered at Whinney Hill in Clayton-le-Moors to listen to a speaker from where they marched on Sykes's Mill at Higher Grange Lane, near the site of the modern police station and Magistrate's Courts, and smashed over 60 looms. These riots spread from Accrington through Oswaldtwistle, Blackburn, Darwen, Rossendale, Bury and Chorley. In the end after three days of riots 1,139 looms were destroyed, 4 rioters and 2 bystanders shot dead by the authorities in Rossendale and 41 rioters sentenced to death (all of whose sentences were commuted). In the 1842 'plug riots' a general strike spread from town to town due to conditions in the town. In a population of 9,000 people as few as 100 were fully employed. From 15 August 1842 the situation boiled over and bands of men entered the mills which were running and stopped the machinery by knocking out the boiler plugs. This allowed the water and steam to escape shutting down the mill machinery. Thousands of strikers walked over the hills from one town to another to persuade people to join the strike in civil disturbances that lasted about a week. The strike was associated with the Chartist movement but eventually proved unsuccessful in its aims. In the early 1860s the Lancashire cotton famine badly affected Accrington, although less so than the wider area due to its more diverse economy, with as many as half of the town's mill employees out of work at one time. Conditions were such that a Local Board of Health was constituted in 1853 and the town itself incorporated in 1878 allowing the enforcement of local laws to improve the town. One well-known association the town has is with the 'Accrington Pals', the nickname given to the smallest home town battalion of volunteers formed to fight in the First World War. The Pals battalions were a peculiarity of the 1914-18 war: Lord Kitchener, the Secretary of State for War, believed that it would help recruitment if friends and work-mates from the same town were able to join up and fight together. Strictly speaking, the 'Accrington Pals' battalion is properly known as the '11th East Lancashire Regiment': the nickname is a little misleading, since of the four 250-strong companies that made up the original battalion only one was composed of men from Accrington. The rest volunteered from other east Lancashire towns such as Burnley, Blackburn and Chorley. The Pals' first day of action, 1 July 1916, took place in Serre, near Montauban in the north of France. It was part of the 'Big Push' (later known as the Battle of the Somme) that was intended to force the German Army into a retreat from the Western Front, a line they had held since late 1914. The German defences in Serre were supposed to have been obliterated by sustained, heavy, British shelling during the preceding week; however, as the battalion advanced it met with fierce resistance. 235 men were killed and a further 350 wounded — more than half of the battalion — within half an hour. Similarly desperate losses were suffered elsewhere on the front, in a disastrous day for the British Army (approximately 19,000 British soldiers were killed in a single day). Later in the year, the East Lancashire Regiment was rebuilt with new volunteers — in all, 865 Accrington men were killed during World War I. All of these names are recorded on a war memorial, an imposing white stone cenotaph, which stands in Oak Hill Park in the south of the town. The cenotaph also lists the names of 173 local fatalities from World War II. The trenches from which the Accrington Pals advanced on 1 July 1916 are still visible in John Copse west of the village of Serre, and there is a memorial there made of Accrington brick. After the war and until 1986, Accrington Corporation buses were painted in the regimental colours of red and blue with gold lining. The mudguards were painted black as a sign of mourning. The 2001 census gave the population of Accrington town as 35,200. The figure for the urban area was 71,220, increased from 70,442 in 1991. This total includes Accrington, Church, Clayton-le-Moors, Great Harwood and Oswaldtwistle. For comparison purposes that is approximately the same size as Aylesbury, Carlisle, Guildford or Scunthorpe urban areas. The 2011 census gave a population of 35,456 for the Accrington built-up area (which includes Huncoat, Baxenden and Rising Bridge in Rossendale). The area in 2001 was listed as 696 hectares (2.69 sq mi), whereas in 2011 it was 742.25 hectares (2.87 sq mi). The borough of Hyndburn as a whole has a population of 80,734. 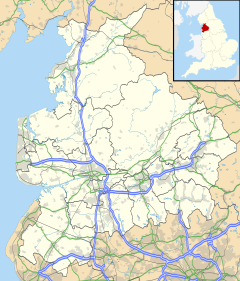 This includes Accrington Urban Area and other outlying towns and villages such as; Altham, Rishton, part of Belthorn, and Knuzden and Whitebirk (considered suburbs of Blackburn). Formerly cotton and textile machinery were important industries in the town. NORIs, a type of iron hard engineering brick, were produced nearby in Huncoat was closed in 2013, but later reopened in 2015. Mills and factories are Accrington's past but there a few factories and garages now occupy the old building. The council has a regeneration plan in place, which will, according to the council, boost the local economy. The plan is to upgrade many old shops, and build a bus station. A memorial for the Accrington Pals may be built outside the town hall. Upgrading all the shops in the town centre. Building a new bus station. Plans for the new bus station, which was later named 'George Slynn' in honour of the former Hyndburn Council leader, were put forward in January 2013 and approved in October 2014. The bus station was completed during and officially opened on 11 July 2016. The new station came under heavy criticism with traders of Accrington's Market and town hall, as it would see the old station discontinued, which was situated much closer and provided ease of access for regular customers. Half of Blackburn Road is being refurbished and is now being made into a more attractive shopping street, upgrading shops, adding more trees, and repaving the pavements. Two new phases are being built, the first one called the Acorn Park, where new houses are being built with balconies and greener spaces, and Phoenix Place, which will also include new housing and the building of a new mosque. Accrington is a hill town located at the western edge of the Pennines within a bowl and largely encircled by surrounding hills to heights of 300-400m. The Hyndburn or Accrington Brook flows through the centre of the town. Hill settlements origins were as the economic foci of the district engaging in the spinning and weaving of woolen cloth. Wool, lead and coal were other local industries. Geographical coordinates: 53° 46' 0" North, 2° 21' 0" West. Height above sea level: there is a spot height outside the Market Hall which is 133.5m; the bench mark on the side of the neighbouring Town Hall is 441.10 feet. The highest height in the town is 320m which is in Baxenden and the lowest is the town hall which is at 132.5m. most of the town is around 200m. There was once a rail link south to Manchester via Haslingden and Bury, but this was closed in the 1960s as part of cuts following the Beeching Report. The trackbed from Accrington to Baxenden is now a linear treelined cycleway/footpath. A train service to Manchester via the Todmorden Curve opened in 2015. A new bus station is being built in Accrington too. Accrington Library, on St James Street, is a Carnegie library that opened in 1908. It is noted for its stained glass window designed by Gustav Hiller and as a place of inspiration for the young Jeanette Winterson. Near the Tesco supermarket, there is Accrington Skate Park which is popular during the school holidays. On Broadway, Accrington Police Station serves the Borough of Hyndburn. In April 2003, Hyndburn Community Fire Station opened, also serving the Borough of Hyndburn. The town is served by the Lancashire Constabulary Police station on Broadway after moving into town from its previous location on Manchester Road as an effort to save money due to rising expenses and decreasing funding by the government. Crime is very low in Accrington compared to nearby towns. Accrington is represented in parliament as a part of the constituency of Hyndburn. The constituency boundaries do not align exactly with those of the district of the same name. Hyndburn consists of 16 wards, electing a total of 35 councillors. Due to its size Accrington is represented by a number of wards in the Borough of Hyndburn. The town largely consists of the Milnshaw, Peel, Central, Barnfield and Spring Hill wards, although some parts of those wards are in other towns in the borough. The local hospital is Accrington Victoria Hospital however, as it only deals with minor issues, Accident and Emergency is provided by the Royal Blackburn Hospital. Other services are provided at the Accrington Pals Primary Health Care Centre and the Accrington Acorn Primary Health Care Centre. The chief publications in the area are the weekly Accrington Observer, part of MEN media, and the Lancashire Telegraph. Accrington Observer is currently stationed within the Market Hall. A Ron Hill 10K marathon happens every year at the end of March or start of April and is named for the local Olympic runner for Britain Ron Hill. The marathon goes around town and through the local countrysides, and is organised by the council and local businesses. There is also an annual 1K family run which began in 2014. In 2015 more than five hundred runners ran in the race. Their also a race held by the local rotary around August time. Main article: Accrington Stanley F.C. Accrington Stanley F.C., entered the Football League in 1921 with the formation of the old Third Division (North); after haunting the lower reaches of English football for forty years, they eventually resigned from the League in 1962, due to financial problems, and folded in 1965. The club was reformed three years later and then worked its way through the non-league divisions to reach the Nationwide Conference in 2003. In the 2005–06 season, Stanley, after winning against Woking with three matches to spare, secured a place back in the Football League and the town celebrated with a small parade and honours placed on senior executives of the team. One of the teams relegated—and thus being replaced by Stanley—were Oxford United, who were voted into the Football League to replace the previous Accrington Stanley. The football stadium is called the Crown Ground. Until the 2012-13 season, when Fleetwood Town entered the league, Accrington was the smallest town in England and Wales with a Football League club. Accrington Stanley Football Club has had its own pub in the town, the Crown, since July 2007. An earlier club, Accrington F.C., were one of the twelve founder members of the Football League in 1888. However, their time in league football was even less successful and considerably briefer than that of Accrington Stanley: they dropped out of the league in 1893 and folded shortly afterwards due to financial problems. The town of Accrington thus has the unique "distinction" of having lost two separate clubs from league football. They are currently placed in EFL League One after winning the EFL League Two title in the 2017/18 season. Accrington Cricket Club plays at Thorneyholme Road in the Lancashire League. Cricket is also played in parks. Schools nearby have shown major interest in cricket and have held cricket training and tournaments. Accrington has a golf course. There are many gyms in the town and the council has held fitness classes for the women and old people. There are two sports centres, the main on being the Hyndburn Sports Centre, Which recently renovated their swimming pool area. near Lidl. St Peters CE Primary School. St Mary's RC Primary School, Oswaldtwistle. All the secondary schools compete each other to achieve better results which resulted in the Hollins Technology College winning an award from SSAT for fantastic progress. The Hollins is also within the top 3% In the country and well known for its development. The college in the town centre is Accrington and Rossendale College; nearby universities include University Centre at Blackburn College, and the University of Central Lancashire in Preston. There is also a library near the town centre where books and internet are available. The Haworth Art Gallery was previously a mansion named as Hollins Hill Mansion. The museum houses a collection of Tiffany glassware presented to the town by Joseph Briggs, an Accrington man who had joined Tiffany's in the late 19th century and eventually became art director and assistant manager.It is situated in Haworth Park on Manchester Road. The Viaduct is a bridge which has a railway line on it, it goes through the town and has many storage units and shop on sale buy the National Rail. The Viaduct ends at the Accrington Eco Station. The Accrington Town Hall was built in the 19th century and is also listed. It has a reception rooms where pantomimes and fitness clubs are held. Weddings could also be held there. The town hall is on Blackburn Road near The Arcade. The Arcade is a Victorian shopping Centre with about 10-15 outlets and has many restaurants there. It is on Church street near the town hall. The arcade has hardware shops and shops like Argos. There are some restaurants in there too. Sadly most outlets are closing since the year 2013. In 2016, there was a revamp of the Arcade which saw specialist shops such as Darts, Vinyl and Knitted Wear added into the Arcade. Oakhill Park is a large and old park with a sceneric view of Accrington. It has won many awards such as the best park in Lancashire It has also been awarded an Eco Award. The Haworth Art Gallery is in the park. It is on Manchester Road. Peel Park is a park in Accrington which was opened by William Peel on 29 September 1909. The Coppice is a hill within the park, and provides a 2.2 mile scenic walk around the park. There was a centenary celebration marking 100 years from the Coppice being handed over to the people of Accrington on 26 September 2009. There was also a refurbishment of the paths and monument at the top of the Coppice at this time. Since then there has been several revamps to the Playground area of the park. ^ a b c UK Census (2011). "Local Area Report – Accrington Built-up area (1119884965)". Nomis. Office for National Statistics. Retrieved 8 February 2018. ^ "Accy's Easter Rising". MEN Media - Accrington Observer. Retrieved 5 July 2011. ^ a b c d e Ellert Ekwall. "Accrington". Place Names of Lancashire. p. 89. Retrieved 5 July 2011. ^ William Farrer, J Brownbill. "Accrington". The Victoria history of the county of Lancaster;. p. 423. Retrieved 28 April 2015. ^ "A Glossary of the Lancashire Dialect". Open Library. Retrieved 17 June 2011. ^ a b c d e f g h i j "'Townships: Old and New Accrington'; A History of the County of Lancaster: Volume 6". William Farrer & J. Brownbill. Retrieved 5 July 2011. ^ a b c d e "Accrington Historic Town Assessment report" (PDF). Lancashire County Council and Egerton Lea Consultancy with the support of English Heritage and Hyndburn Borough Council. Archived from the original (PDF) on 1 October 2012. Retrieved 18 June 2011. ^ "Patterns of Migration of Textile Workers into Accrington in the Nineteenth Century" (PDF). William Turner. Retrieved 18 June 2011. ^ a b H Barrett & C Duckworth (2004). Accrington Old & New. Frith Book Company Ltd. ISBN 1-85937-806-4. ^ "Cotton Times". Doug Peacock. Archived from the original on 4 June 2011. Retrieved 17 June 2011. ^ Turner, William (1992). Riot! Story of East Lancashire Loom Breakers in 1826. Lancashire County Books. ISBN 978-1-871236-17-0. ^ Newbigging, Thomas (1893). History of the Forest of Rossendale. Rossendale Free Press. ^ Jackson, Andrew C (2009). "The Accrington Pals". Retrieved 14 April 2013. ^ UK Census (2011). "Local Area Report – Hyndburn Local Authority (1946157094)". Nomis. Office for National Statistics. Retrieved 10 February 2018. ^ Macpherson, Jon (2013). "New Accrington bus station open by 2015". Retrieved 24 August 2016. ^ Abbit, Beth (2014). "Plans approved for controversial Accrington bus station scheme". Retrieved 24 August 2016. ^ Macpherson, Jon (2016). "GALLERY: New Accrington bus station officially opens". Retrieved 24 August 2016. ^ Abbit, Beth (2013). "Traders fears new Accrington bus station could put them out of business". Retrieved 24 August 2016. ^ Macpherson, Jon (2016). "Angry Market Hall traders petition for bus stop after 'loss of trade'". Retrieved 24 August 2016. ^ "Major work to enhance Blackburn town centre streets underway". Lancashire Telegraph. Retrieved 1 December 2016. ^ Magill, Peter (30 April 2013). "New Manchester route will revitalise Burnley branch station". Lancashire Telegraph. Newsquest (North West). Retrieved 2 May 2013. ^ "Bus map & guide: Your Guide to Services throughout Accrington & Surrounding Area". Lancashire County Council. November 2010. Retrieved 14 April 2013. ^ "End of the line for struggling Accrington Bus Firm". 21 September 2016. Retrieved 18 November 2016. ^ "Crime Map for Accrington Towne Centre". police.uk. Retrieved 28 February 2018. ^ Pickup, Mark. "Peel Park and the Coppice". www.hyndburnbc.gov.uk. Archived from the original on 7 March 2016. Retrieved 5 March 2016. ^ Woods, Gabriel Stanley (1912). "Macrorie, William Kenneth" . In Lee, Sidney (ed.). Dictionary of National Biography (2nd supplement). 2. London: Smith, Elder & Co.
Wikivoyage has a travel guide for Accrington. Wikimedia Commons has media related to Accrington.